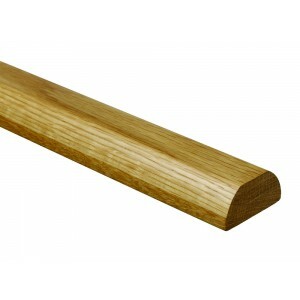 White oak baserail sections for use with the Richard Burbidge Fusion range. Fusion Glass stair parts are made up of the same pre-finished timbers as the original Fusion stair part range, including newel posts, baserails, handrails and the metal connectors, but with a glass panel infill instead of the metal spindles. These 6mm toughened glass panels are held in place by metal brackets with a choice of chrome or brushed nickel finishes that give a distinctly modern and open look. These stair parts are specially designed to be easy to install using the metal brackets that simply connect everything together. Fusion is only suitable for use with stairs that have a pitch between 38 degrees and 45 degrees only. Glass panels are excellent for maximising the sense of space in a room, making it feel bigger, lighter and brighter. 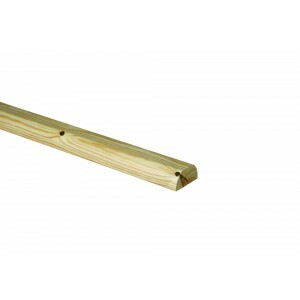 They also add a touch of contemporary glamour that is also practical, giving you a vital safety barrier on staircases. Fusion glass balustrades are also ideal for homes with an open-plan design. If the stairs rise from your living room, for example, the transparent panels will provide security without being overly intrusive or blocking out precious light. Richard Burbidge SBR4200WO Fusion White Oak Baserail 4200 x 55 x 27mm.